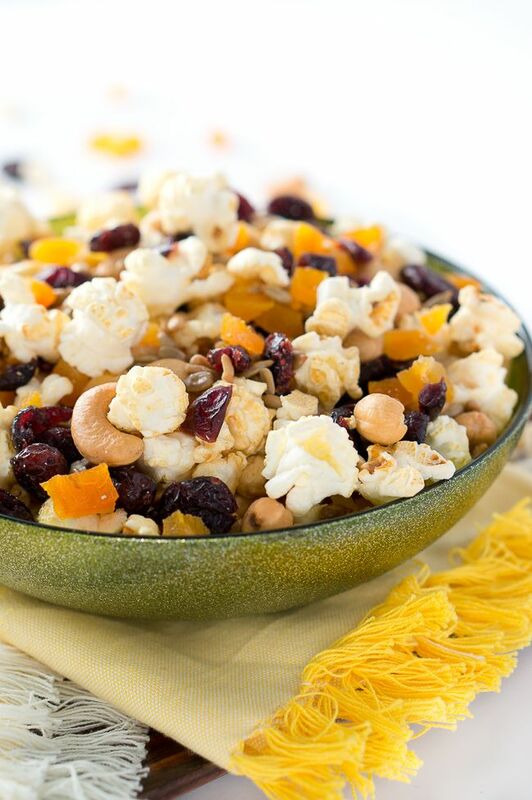 Sweet and salty – this healthy popcorn trail mix has it all! Perfect for snacking, a party and any holiday! So easy to make too. What I love about this healthy popcorn snack is that you get to enjoy the taste, flavors, and satisfaction without over consuming unhealthy ingredients. 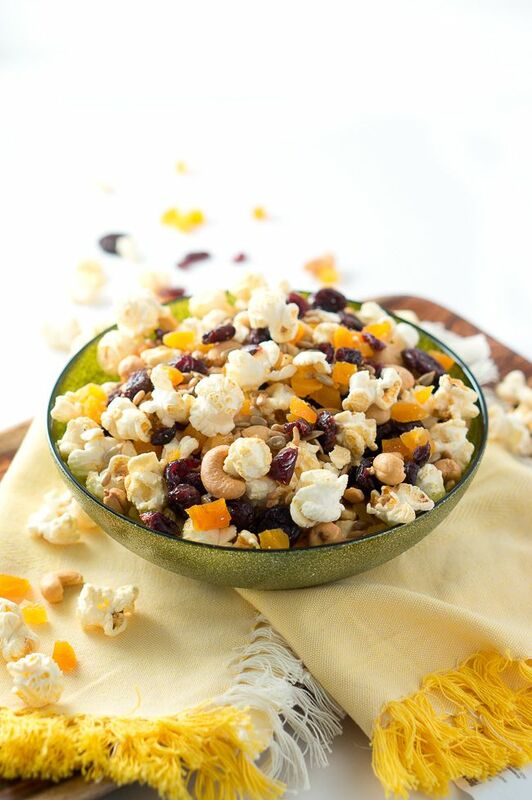 One to two cups of popcorn with a small handful of nuts, seeds, and dried fruits will hit the spot. 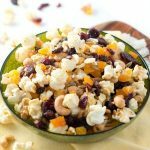 This healthy popcorn trail mix is also a fantastic and easy snack for family game nights or for a party. If you like making popcorn for family movie nights, like I do, I think you will enjoy this popcorn trail mix. 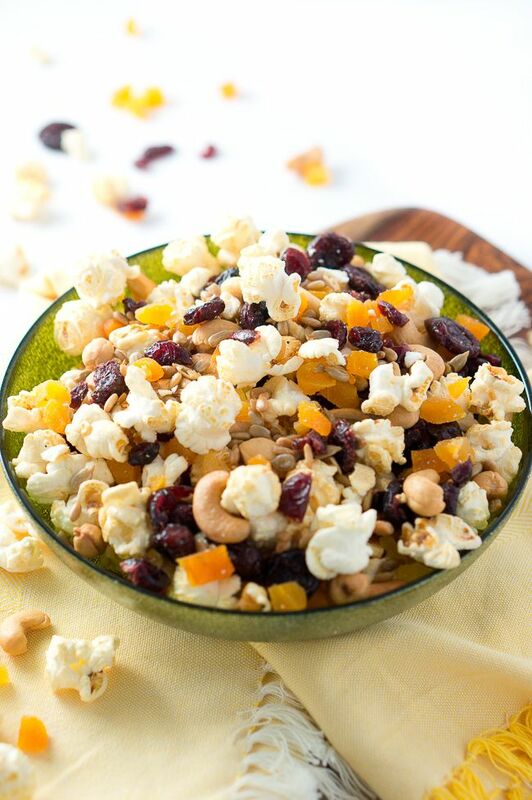 The combination of sweet & soft dried fruits, crunchy nuts, and popcorn is amazing! 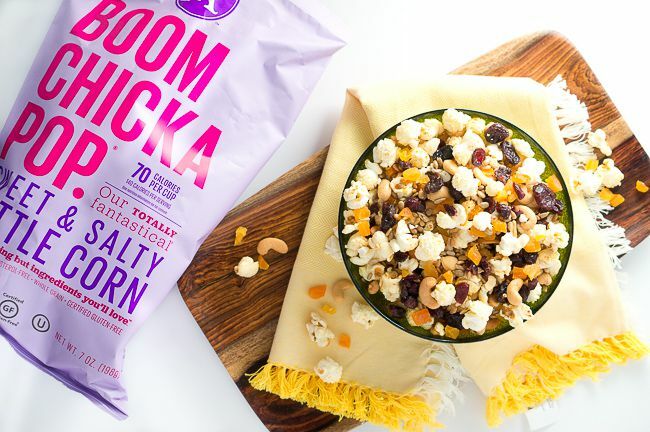 BOOMCHICKAPOP is a certified gluten-free and uses non-GMO ingredients in all their products. 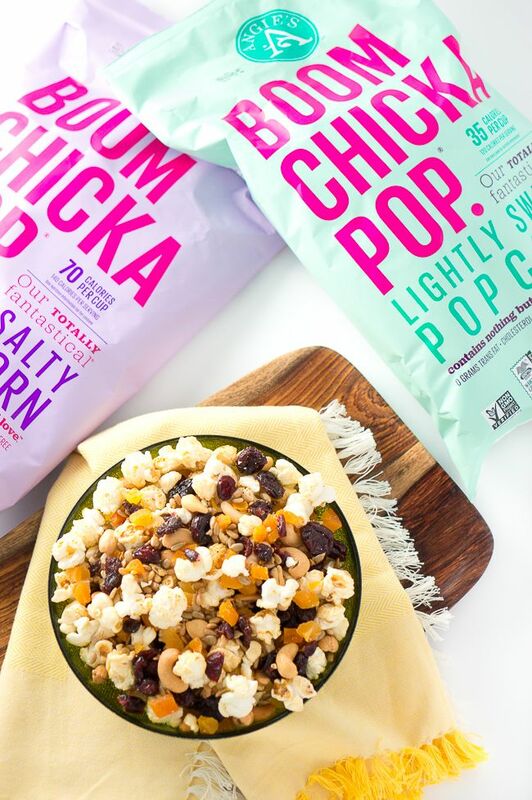 The popcorn comes in eight flavor varieties – check out BOOMCHICKAPOP’s website for all their different flavors. I love that this popcorn keeps it simple with only a handful of ingredients per bag with nothing artificial. It’s great-tasting and fun! You can munch away guilt free while watching your favorite football team play. Everyone will enjoy this tasty BOOM snack mix while watching the game. You can substitute any nuts/fruits of choice in this recipe to create your own. Enter for a chance to win one of five Game Day Kits from BOOMCHICKAPOP by sharing a photo of how you #BringtheBOOM to Game Day. BOOMCHICKAPOP will randomly pick the winners and mail prizes out to each individual. Today’s post is sponsored by BOOMCHICKAPOP, but my love for their totally fantastical snacks is all my own! Place popcorn in a large bowl. Add nuts, seeds, dried fruits to bowl and stir to mix. 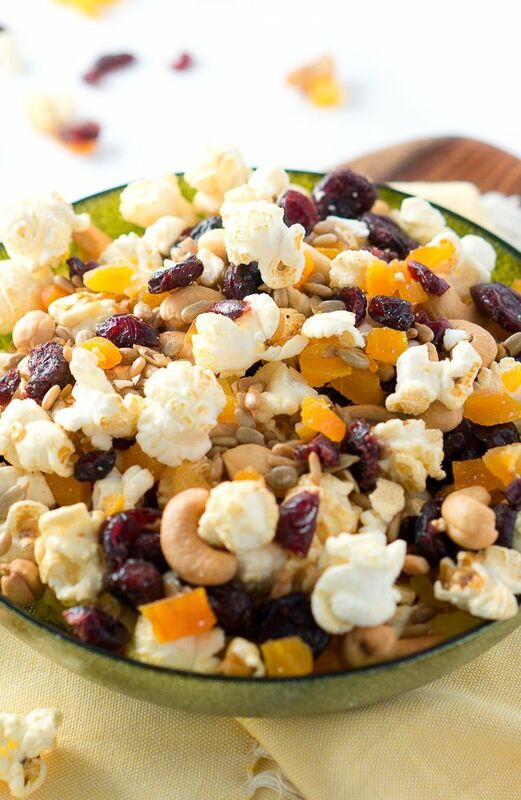 Sweet and salty - this healthy popcorn trail mix has it all! Perfect for snacking, a party and any holiday! So easy to make too. This quick snack sounds perfect for munching on anytime! I’m always looking for something to tide me over before dinner. Bonus that this popcorn snack is healthy! I love this. I’m always looking for delicous trail mixes that don’t have chocolate. Love the addition of popcorn! Thanks, Tracy! You will love this trail mix – it doesn’t have any chocholate, but it’s slightly sweet and salty – perfect snack in my opinion. That’s a snack I would like to munch on, your photos are gorgeous too! Love the flavours you have got running through this popcorn, nice job! 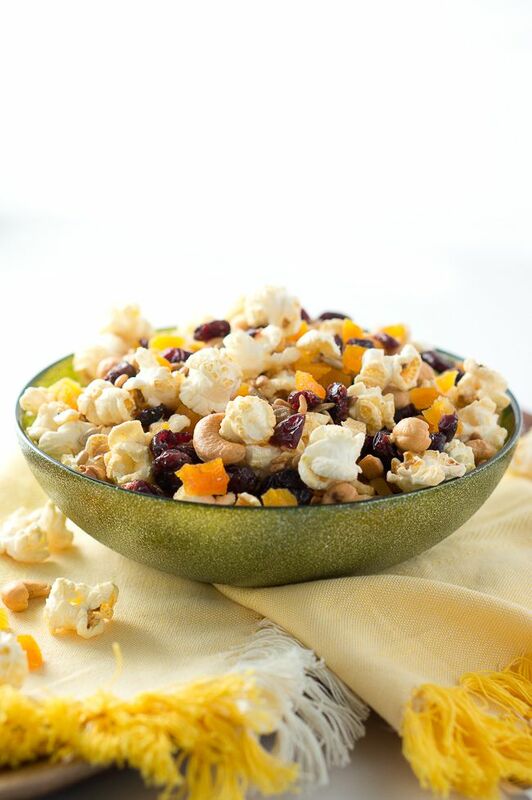 What flavor of popcorn did you use for this trailmix? Thanks. I plan to add this recipe to my kid’s lunch. Yum! This looks great! Looking into distributing this recipe into schools since corn is October’s grain of the month (and giving you credit, of course)! Is the serving size one cup? Hi Abi, this makes about 11 1/2 cups of popcorn trail mix. The serving size noted here is more like 1.5 cups. But if you would like to use 1 cup as a serving size, it will make about 12 servings.